Tidal freshwater wetlands (TFW) are situated in the upper estuary in a zone bordered upstream by the nontidal river and downstream by the oligohaline region. Here, discharge of freshwater from the river and the daily tidal pulse from the sea combine to create conditions where TFW develop. TFW are often located where human population density is high, which has led to wetland degradation or destruction. Globally, TFW are largely restricted to the temperate zone where the magnitude of annual river discharge prevents saline waters from penetrating too far inland. The constant input of river water delivers high loads of sediments, dissolved nutrients, and other suspended matter leading to high sedimentation rates and high nutrient levels. Prominent biogeochemical processes include the transformation of nitrogen by bacteria and immobilization of phosphate. A diverse, characteristic vegetation community develops which supports a rich fauna. Biotic diversity is highest in the high marsh areas and decreases in the lower levels where tidal inundation is greatest. Benthic fauna is rather poor in diversity but high in biomass compared to other regions of the estuary. Global climate change is a threat for this system directly by sea level rise, which will cause brackish water to intrude into the fresh system, and indirectly during droughts, which reduce river discharge. Salinity will affect the presence of flora and fauna and facilitates sulfate reduction of organic matter in the soil. Increased decomposition of organic matter following saltwater intrusion can result in a lowering of wetland surface elevation. 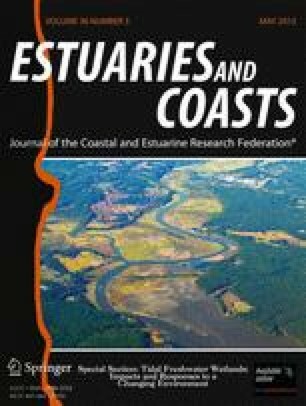 The papers assembled in this issue focus on how these tidal freshwater wetlands have changed over recent time and how they may respond to new impacts in the future. We thank Mary Leck, Carlton Hershner, and Iris Anderson for reviewing earlier drafts of our “Introduction” section and offering many constructive comments. We also thank the following individuals for reviewing the manuscripts in this issue: Carmen Aguilar, Linda Blum, Suzanna Brauer, John C. Callaway, Bob Christian, Robert J. Diaz, Heida Diefenderfer, Stuart Findlay, Marilyn Fogel, Carlton H. Hershner, Cheryl Kelley, Carla Koretsky, Adam Langley, Mary Leck, Shufen Ma, Robin Miller, Gregory Noe, Steven C. Pennings, Michael Piehler, Marty Rabenhorst, Lawrence P. Rozas, Lori Sutter, Christopher Swarzenski, Jenneke Visser, Nathaniel B. Weston, Kimberlyn Williams, Lisamarie Windham-Myers, Joseph Yavitt, and Susan Ziegler.